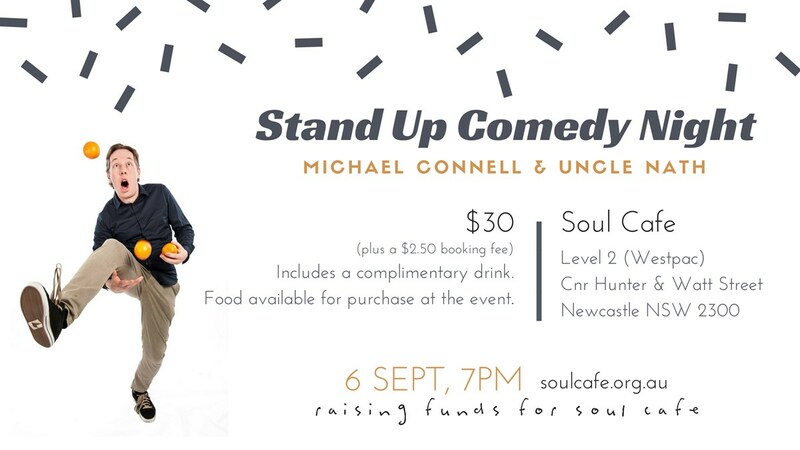 A night of comedy for a good cause with Michael Connell and Nathan Ranclaud raising much needed funds for a local community charity, Soul Café. A complimentary drink is included in the ticket price. Food for purchase will be available. Soul Cafe provides hundreds of free meals per week to highly disadvantaged members of our community many of whom are homeless, have a mental illness, substance abuse issue or live in poverty. Our meals are simply the medium to be able to work with people in a greater way. Services provided include the Soul Clinic – Doctors, Mental Health Clinic, Podiatry, Hearing Care, Centrelink, Hunter Primary Care, Disability Advocacy NSW, Legal Services, Legal Aid, Alpha Course, Chaplain & Floor Team, Haircuts, SMART Recovery (Drug & Alcohol Program), Gamblers Anonymous, Narcotics Anonymous, the ‘Random Souls’ Music Group and Jenny’s Place. Other resources made available to Soul guests include blankets, swags and hygiene packs. All these services are provided through the generosity of the community as Soul Care receives no government funding. The proceeds of this event go to Soul Café to support this much needed community service.